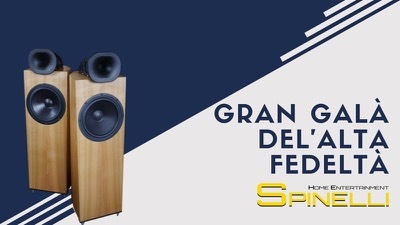 After the big success of the Gran Galà dell'Alta Fedeltà in Milano, Spinelli, our local dealer, invited his customers to listen to the system of the show. The setups were 3 and the loudspeakers playing were 4. All Cammino Cabling, all Octave amplification. Really amazing systems, all really enjoyable. We spent the day talking with people and listening to music. That was good… meanwhile, our children were amazingly playing: everyone had his fun!! Our Milan dealer Spinelli in cooperation with Cammino decided to participate to an event of Giulio Cesare Ricci: they exposed at the Gran Galà dell'Alta Fedeltà in Milano. The choice was to keep the costs of the whole system at a relatively reasonable target. Well, they went up to about 50.000€. But compared with other systems playing in other rooms, they plaid with a bargain system. 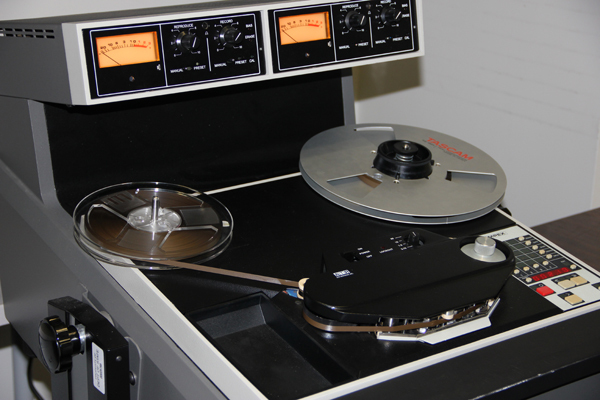 The aim was to have a music performing system, not an HiFi system tuned to be audiophile, but a system to play music. Any kind of music or recording, old or new, or whatever. The room was always full with enthusiastic people. Vinyl was a little bit less than the Master tapes, but anyway was really high quality. Petra Magoni, of Musica Nuda, attended the event as well because it was the Foné presentation of their last LP, Little Wonder (here more info about it). She jumped on the chair when she discovered how much information was present on the tapes and could be reproduced by our system. She did not want to believe it and recognized some particular sound flaws of the Contrabass of Ferruccio Spinetti. Thinking out of the box, the event is happening on Sunday Monday instead of Saturday Sunday. Well. Armin Kern, our Representative North of the WeißWurst-Equator will present our products together with the products of Supra, Nottingham Analog and Synthesis. A quite good promising setup. Enjoy and book a personal presentation directly with him. It was a really crowded event, lots of people talking and getting in contact eager to know and understand the news on the music reproduction. 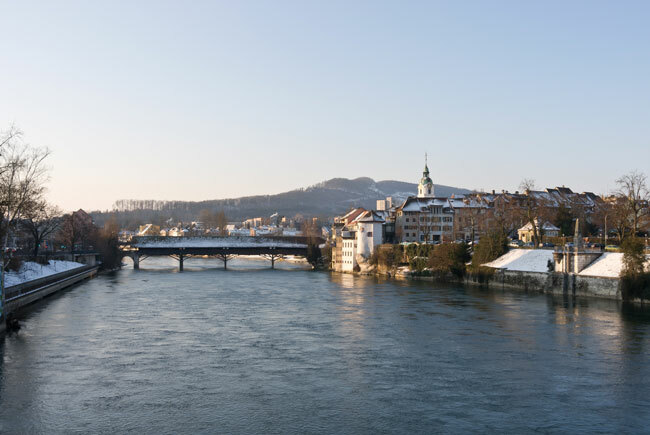 Our distributor, André Aebischer, from Soundrevolution.ch was very enthusiastic about the event in Olten. Here are his words in German! Es war ein sehr erfolgreicher Tag. Es hatte nicht wahnsinnig viel Leute aber alle hatten viel Interesse.Die Kommentare zu Blumenhofer, Einstein und natürlich Hegel waren sehr positiv!Die meisten kannten Blumenhofer nicht, waren aber erstaunt wie gut die Lautsprecher klingen.Wir planen in Zukunft zwei Events pro Jahr bei Christian zu machen. Einer im Frühling und einer im Herbst.Im EG führten wir folgendes System laufen:Quelle: Mac Computer (AirPlay) oder CD Transport Gato Audio CDD-1beides über den Hegel Wandler HD30 (Computer USB) und (CD Coaxial Digital. )Verstärker Vollerstärker Hegel H160.Lautsprecher Blumenhofer Tempesta 17Und Strom natürlich über den Cammino HarmonizerIm UG hatten wir folgendes System laufen.Plattenspieler Thales TTT-Compact mit Tonzelle EMT JSD 6Phonovorverstärker von Einstein The little big phonoVollverstärker Einstein The TuneLautsprecher B&W........ ähh sorry Blumenhofer Genuin FS 3 MK 2 Und das ganze wieder über den Cammino Harmonizer.Ich bin froh, dass ich diesen Lautsprecher gekauft habe, der ist wirklich genial!! 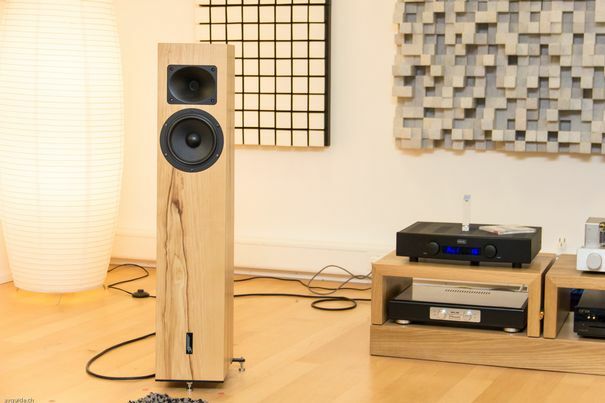 For those not speaking German, in the end he says that he is really happy to have a Genuin FS 3 MK 2, it is a gorgeous loudspeaker!! 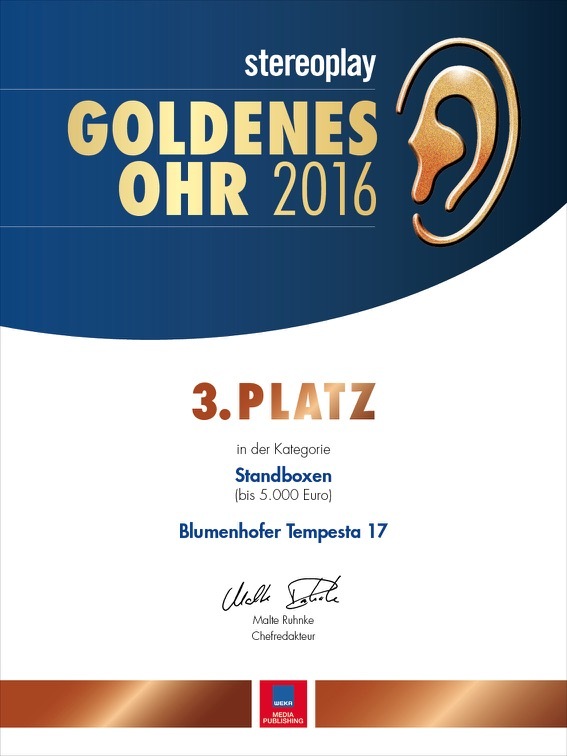 Stereoplay awarded our Tempesta 17 with the golden ear award. We were on place 3. We are really engaged and pleased by the quality we have achieved with this product! It is not about tools and gears for reproduction of music. It is about music at all. In this show we had a special room to make what we like: we played music. Walter took several pictures of the event, here You can watch them on his web pages or here You can have a look at the ones we have chosen. This year Blumenhofer was present in 2 rooms. One room was our room in the 16th floor, shared with Einstein. 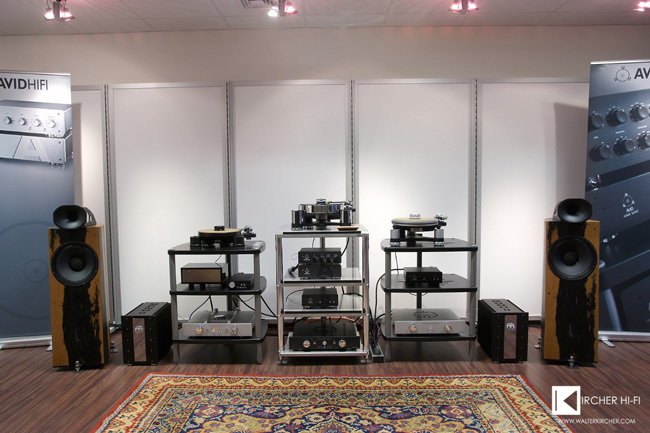 The other room was in the base floor, driven by the Analog Audio Association. In the Einstein Room we played the Genuin FS 3 MK 2 signature edition combined with The Amp Ultimate from Einstein and the Air Force III from TechDas turntable. In the AAA room the Tempesta 17 was playing on an ASR integrated amp with the turntable project from the Analog Audio Association. Both of the room had lots of visitors and the Tempesta 17 proved itself as a good allrounder to support the several seminars and information happening made by the AAA people. The Genuin FS 3 MK 2… for me it was the first time I had the chance to use it and test it how it performs in a show environment. 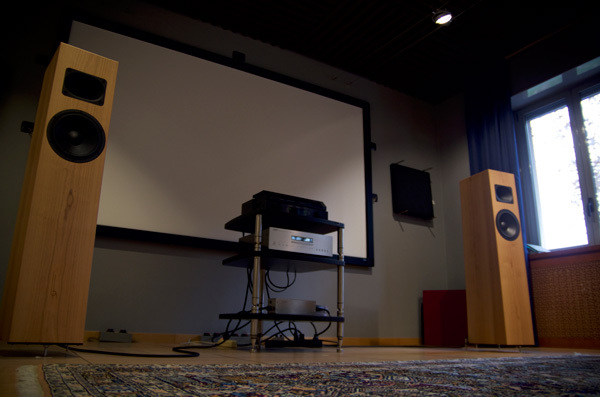 I'm pleased, no hassle in setting it up, no problems in having it playing the way we desired, no fatigue during the 2 days of listening… in fact we spent the whole Friday at listening as well: we were ready with the setup really fast! And, as usual, at the end of the Friday we paid a visit to the centre of the town and shopped for LPs: it is always a good moment and a good way to relax. 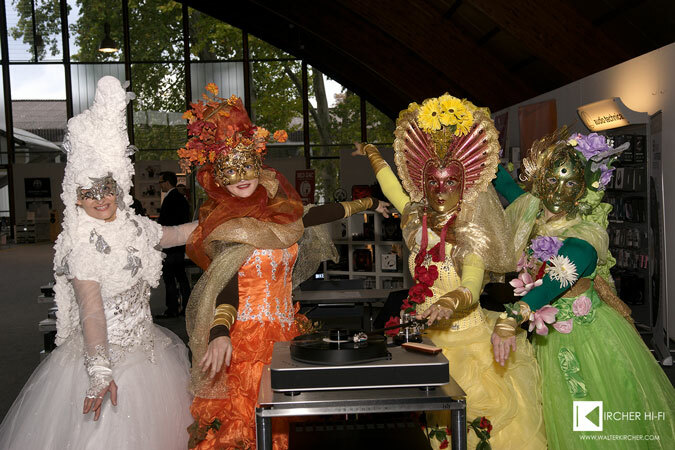 It is useless to say that the show was gorgeous: everybody knows about the Audio Video Show in Warsaw, Poland. I did not. The more I've seen the more I was surprised by the dimensions and the perfect organization of the event. Adam has been able to build a real big, challenging, amazing event. Nearly 150 rooms, I do not know if it is the second or the third biggest HiFi show in Europe, together with the Munich High End and the Norddeutsche HiFi Tage in Hamburg. When somebody claimed it was great, I could not imagine how great it is. For the first time the 50 rooms at the national stadium have been added to the show rooms of the hotels. And we were there in one of those. Now, to our presence: we were present in 2 rooms. One room in the main hotel another room is in the stadium. We took all the time needed to setup the system and we let it play for the whole time, from the beginning of the show until the end. As usual we had wonderful surprises as we noticed that some of the components were getting better and better (in the end some of them were not even burned in). And then we have discovered that people liked all the different kind of musics. There are shows, where You only can play classical music, there are shows where the classical music sounds like an invitation to exit from the room. In Warsaw it has been totally different! Death Metal, or Violin, Hard Rock or Soft Melodics. As soon as the music was good, people of all ages came in. To see Yourself, You can have a look at our picture gallery here or come to the Audio Video Show 2016. Lots of people told me that this is a small show. Well they should be disappointed by that: the show is big! There were at least 25 rooms and huge crowd of people. We shall not forget that Slovenia only bears about 2 million inhabitants. The Ljubljana Multimedia HiFi show is big (here its FaceBook page), and it is worth participate to it. No doubts on that. I was thinking about it since at least 2-3 years and this year, with the meeting with Igor Opassi from Tafos Audio this idea became real. The quality of our performance rose day by day and we have been able to deliver the quality of sound I'm used to. Each day we had to face different problems in the room, but every day we have been able to master them! Thanks to Claudio Trevisanello from Cammino and our all ideas and intuitions. One time more I state that his products are a value added to the performance. Surprising was the EL 84 Power Amplifier of Trafomatic. There are no other words to describe it: it has been able to push the music and transfer the life feeling trough the whole chain! It was worth being there. We think about being there again next year! Even with the hope to meet some of the people again! That was amazing, such a huge amount of people was not expected: we were ready to relax at the show, but in fact we had a huge amount of contacts that it is unbelievable! 4 Seasons - beautiful ladies came to visit us. In the name of Music and Beauty. Platte trifft Teller, Klang trifft Bilder, Hörgenuss auf Augenschmaus! Rocker auf Röcke, Djs auf Djanes, HipHopper auf Austropopper, Schellacks auf Feschaks, Damen auf Herren, Junge auf Junggebliebene, …… und alle eint das Faible für Schall und Platten, für Vinyl & Musik!Über 70 internationale Aussteller auf cirka 1.400 Quadratmetern, zahlreiche Live-Acts, ein abwechslungsreiches Rahmenprogramm, unzählige Tonträger, HiFi, Zubehör und ausgewählte Exponate der Sonderschauen "HiFi-Legenden und "50 jahre BEATLES in Österreich" machen die Vienna Vinyl & Music Fair zur Messe für Ihre Ohren. Und irren Sound! "Die Messe für Ihre Ohren und irren Sound" bringt dank ihres einzigartigen Konzeptes Musikliebhaber, Musikschaffende und HiFi-Hersteller zusammen. Die jeweils 3.000 bis 5.000 Besucher erwarten zahlreichen Live-Actts, dj-sets, HiFi vom Feinsten und rund eine halbe Million Tonträger. 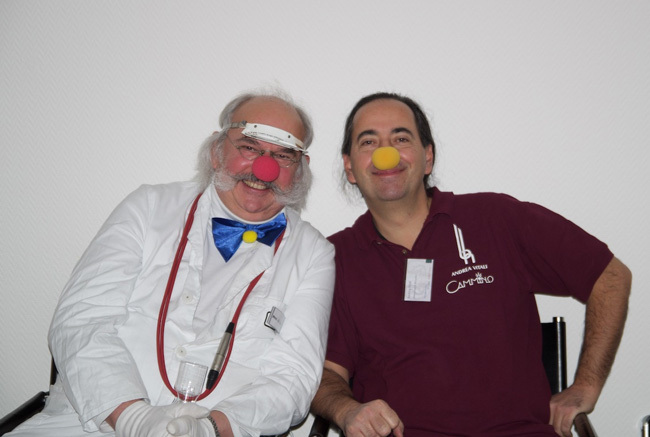 Here You can read the Blog comments of Walter Kircher: it is worth it and it is in english. Platte trifft Teller, Klang trifft Bilder, Hörgenuss auf Augenschmaus! Rocker auf Röcke, Djs auf Djanes, HipHopper auf Austropopper, Schellacks auf Feschaks, Damen auf Herren, Junge auf Junggebliebene, …… und alle eint das Faible für Schall und Platten, für Vinyl & Musik!Über 70 internationale Aussteller auf cirka 1.800 Quadratmetern, zahlreiche Live-Acts, ein abwechslungsreiches Rahmenprogramm, unzählige Tonträger, HiFi, Zubehör und ausgewählte Exponate der Sonderschauen "HiFi-Legenden und "50 jahre BEATLES in Österreich" machen die Vienna Vinyl & Music Fair zur Messe für Ihre Ohren. Und irren Sound! "Die Messe für Ihre Ohren und irren Sound" bringt dank ihres einzigartigen Konzeptes Musikliebhaber, Musikschaffende und HiFi-Hersteller zusammen. Die jeweils 3.000 bis 5.000 Besucher erwarten zahlreichen Live-Actts, dj-sets, HiFi vom Feinsten und rund eine halbe Million Tonträger. We played, but that was not the main point, we played our Genuin FS 2 in an Accustic Arts setup. Crowned by a Dr. Feickert Blackbird turntable. And there was a second setup, with a Tempesta 17. 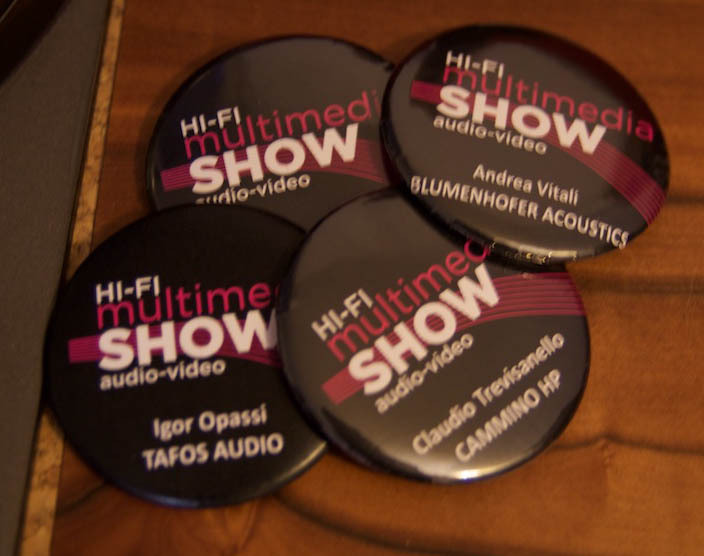 But for sure it was not an audiophile show, it was all about Music, the way it should be. The gigs? Well, astonishing, really professionals and amazing music made. For the first time in my life, I enjoyed an hammond, live!! My opinion? Well, believe me, this show will grow. This show has a really astonishing potential! And we are one important part of it. You will see in 5 years: if the cards are played in the proper way, it is going to become one of the reference show in the German speaking countries! I can imagine Music playing well and lot of people. 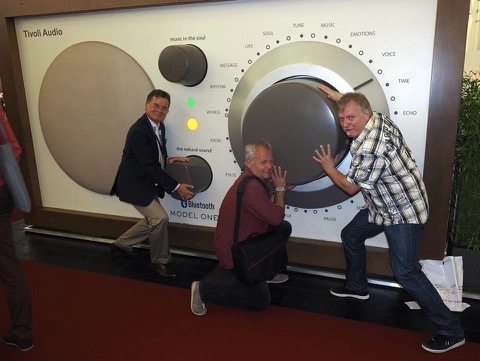 The SIAV in Shanghai at the Shanghai International Convention Center has a 20 and more years tradition and it is a fix appointment in the Chinese HiFi industry. I hope sooner or later to be able to go there again myself! Here to see the few pictures I got from China. 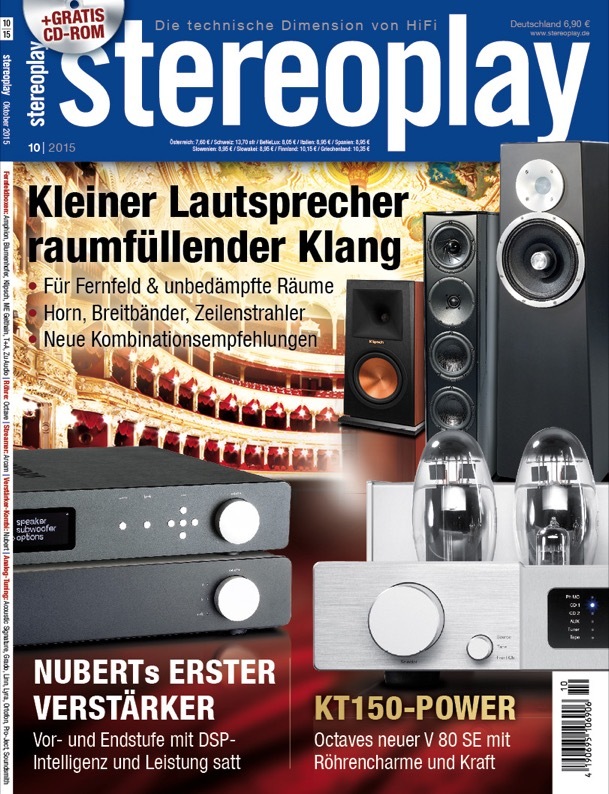 Wolfgang Kemper from HiFi Statement wrote a charming review of the Tempesta 17. Helmut Baumgartner made wonderful pictures of the Tempesta 17 we sent him. 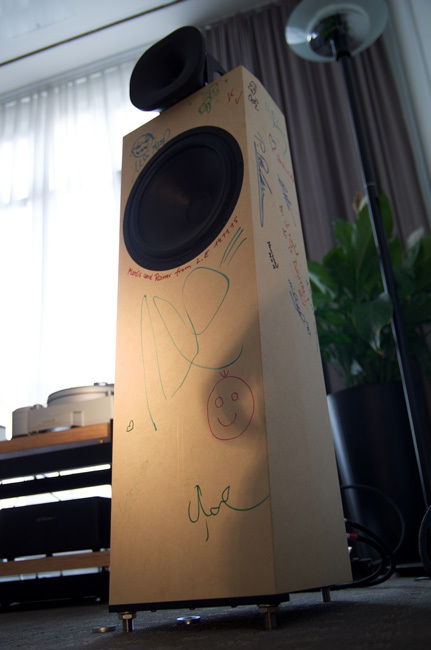 The whole review was very appealing and able to highlight the quality of the loudspeaker.